Hello everyone. Just to let you know that from today Beckworth can boast having it’s very own (council subsidised) mobile pet pampering service. Run out of the back a converted ice cream van by award-winning pet-caring husband and husband team Neville and Mohammed Norwich, we specialise in cosseting all breeds of land- and water-dwelling gastropod and testudines (Tortoises, turtles, snails etc). 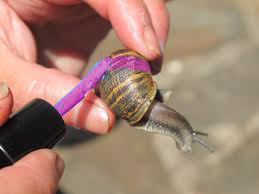 So if your pet slug needs a shampoo, your snail a manicure, your limpet a lacquering or your a terrapin a brightly painted shell, call on the experts Heaven & Shell. We’re pitched up everyday outside the sexual health clinic in the high street, so why not drop in with your loved ones.